Dozens of workers in the provinces of Ninewa and Kirkuk took to the streets on Monday, March 11th, calling on the Iraqi government to revive the local industry, support domestic produce and put a ban on the import of foreign goods. 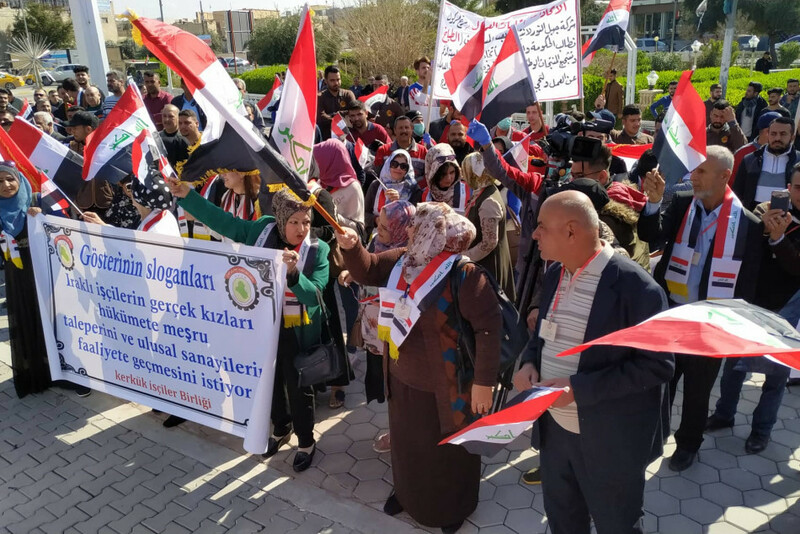 In Kirkuk, demonstrators, among them a significant number of women, gathered outside the building of the Kirkuk governorate to lay out their demands in a peaceful protest. KirkukNow correspondent said protestors said the protestors, many of them members of the Kirkuk workers syndicate demand the support of local produce and also reduce dependence on foreign workforce and urged for improving their contracts. Meanwhile, in Mosul, labourers put forth ten demands, including the compensation of shop owners whose properties were destroyed during the war against the Islamic State (IS) group, raising the pensions of labourers and to exempt property renters from taxes for the period the province was under IS control. KirkukNow correspondent indicated that one of their main demands was the allocation of bank loans to assist new graduates and unemployed people to start small businesses.